17 December 2016 - Toilet pumped out. Acacia at top of track fell over on track, so cut it up and moved it to top of embankment. 30mins work. 16 December 2016 - Slashed spear thistle in golf course triangle. 1 hrs work. 12 December 2016 - Mowed golf course triangle. 2 hrs work. 9 December 2016 - Community work day. Mulched south of MW track entrance. Helen B & C, Gail & Russell weeded south of track. - 11 volunteers - 33h work. 2 December 2016 - Installed trail cam in golf course triangle. 1 December 2016 - Mowed woodland south west of billabong. 2 hrs work. 28 November 2016 - Mowed verges, picnic area and carpark area and woodland south east of billabong. 2 hrs work. 27 November 2016 - Community work day. Mulched opposite MW track entrance. Helen B. spread poa seed around (north of billabong), and some weeding done. 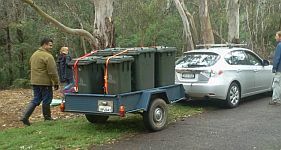 Pic shows the way to easily move 1 cubic metre of mulch in a trailer that only takes 0.6cubic metres. - 7 volunteers - 23h work. 11 November 2016 - Community work day. Mulched opposite MW track entrance. Weeded along track in golf course triangle of billabong. 11 volunteers - 37h30m work. 10 November 2016 - Mowed verges, southern area and beside MW track of golf course triangle. 2 hrs work. 30 October 2016 - Community work day. Mulched opposite MW track entrance. Weeded south (east) of billabong. Mowed north-east section of golf course triangle. 7 volunteers - 21h45m work. 27 October 2016 - Mowed verges, and western area of golf course triangle woodland. 2 hrs work. 26 October 2016 - Slashed woodland near MW track. 1.5 hrs work. 14 October 2016 - Community work day. Planted 50 tufted bluebell (Wahlenbergia communis), 104 Kidney plant (Dichondra repens), 54 basalt daisy (Brachyscome multifida), 120 weeping grass (Microlaena stipoides) north of path where debris had been removed. 11 volunteers - 38h45m work. 13 October 2016 - Mowed woodland south west of billabong. 2 hrs work. 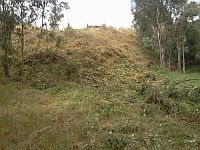 8 October 2016 - Mowed verges, woodland south east of billabong, mowed and slashed top level. Moved debris beside track to northern golf course triangle. 4.5 hrs work. 6 October 2016 - Mowed verges, picnic area, near MW pumping station, and southern section of golf course triangle. 2.5 hrs work. 60cm tiger snake near MW pumping station. 29 September 2016 - Removed branches from beside the track to golf course triangle for cremation. Gail weeded. 2 x 2 hrs work. 25 September 2016 - Community work day with Monash Uni students, Melbourne High School students and community volunteers. Planted 54 prickly moses (Acacia verticillata), 54 bidgee widgee (Acaena nova-zelandiae), 27 rock correa (Correa glabra), 27 hop goodenia (Goodenia ovata), beside path in golf course triangle and woodland, mostly west of path and north of MW track. Spread mulch behind lomandras west of path bend past culvert. Burned debris from beside track. 28 volunteers - 102h30m work. 23 September 2016 - Community work day with Melbourne High School students and community volunteers. Planted 54 slender speedwell (Veronica gracilis), 108 purple-sheathed tussock-grass (Poa ensiformis), 108 kidney plant (Dichondra repens), , beside path in golf course triangle and woodland, mostly west of path and north of MW track. Spread mulch behind lomandras west of path bend past culvert. 21 volunteers - 73h30m work. 17 September 2016 - mowed north section of golf course triangle, verges, picnic and carpark areas. Removed 3 bitou bushes from Burke Rd. verge, and lopped Ash tree opposite MW track junction. 2 hrs work. Bat check - about 20 bats in Tubes 8 & 9. 16 September 2016 - Community work day. 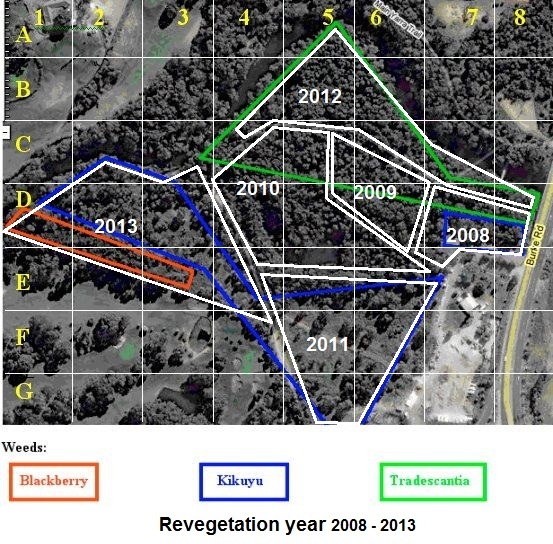 Planted 54 slender speedwell (Veronica gracilis), 27 rock correa (Correa glabra), 27 tufted bluebell (Wahlenbergia communis), 27 Spiny-head Mat-rush (Lomandra longifolia), 27 forest germander (Teucrium corymbosum), beside path in golf course triangle and woodland, mostly west of path and north of MW track. Spread mulch behind lomandras west of path bend past culvert. 7 volunteers - 24h30m work. 3 September 2016 - mowed verges, picnic and carpark areas. 45mins work. 28 August 2016 - Community work day. Planted 54 purple-sheathed tussock-grass (Poa ensiformis), 54 Hazel pomaderris (Pomaderris aspera), 54 goosefoot fishweed (Einadia trigonis), 20 Vic Christmas bush (Prosanthera lasianthos), 88 Slender Speedwell (Veronica gracilis), 54 prickly tea tree (Leptospermum continentale) through all the planted areas. Spread mulch opposite lomandras west of path bend past culvert - with trailer and wheelie bins. 19 volunteers - 63h15m work. 21 August 2016 - Bat check. 3 Gould's wattled bats - all unbanded. Slashed fumitory on west bank of billabong. 1h work. 13 August 2016 - mowed verges, picnic and carpark areas, woodland south of billabong - eastern and north=western sections. 2.5h work. 12 August 2016 - Community work day. Planted 54 purple-sheathed tussock-grass (Poa ensiformis ), 27 Prickly moses (Acacia verticillata ), 27 Lomandra (Lomandra longifolia), 27 forest germander (Teucrium corymbosum), and 27 prickly moses (Acacia verticillata) around picnic area. Spread mulch behind lomandras west of path bend past culvert - with trailer and wheelie bins. Burnt off some debris near path. Weeded south east bank of billabong. 10 volunteers - 42h45m work. 6 August 2016 - Slashed fumitory near path in golf course triangle, along golf course fence, and south bank of billabong. 4h work. 5 August 2016 - Joined by 8 students and 2 teachers from Ruyton Girls School. Planted 54 purple-sheathed tussock-grass (Poa ensiformis ), 27 rock correa (Correa glabra), 27 tufted bluebells (Wahlenbergia communis), 27 pale Flax Lily (Dianella laevis), and 27 basalt daisy (Brachyscome multifida) on east side of golf course triangle. Gail & transplanted some river red gum and tree violet seedlings to eastern picnic area. 12 volunteers - 28h work. 31 July 2016 - Community work day. 11 regulars joined by 11 students & 1 teacher from Camberwell Grammar School. 2 Canterbury Girls School students and a RMIT PhD student. Planted 108 purple-sheathed tussock-grass (Poa ensiformis ), 54 bidgee-widgee (Acaena nova-zelandiae), 108 weeping grass (Microlaena stipoides), 27 Prickly moses (Acacia verticillata ), 27 rock correa (Correa glabra), 27 forest germander (Teucrium corymbosum), and 27 snowy daisy bush (Olearia lirata). Spread mulch behind lomandras west of path bend past culvert. 26 volunteers - 86h30m work. 23 July 2016 - Gail & I spread mulch on cardboard behind lomandras. Transplanted 2 river red gium seedlings from lomandra area to eastern picnic area. 3 hours work. 22 July 2016 - Gail, Brad & I spread mulch behind lomandras, using cardboard from election booths. 2.5 hour work. 20 July 2016 - Spread mulch behind lomandras. 1.5 hour work. 16 July 2016 - Mowed verges, north-east golf course triangle, picnic area and top level. 1.5 hour work. Bat check 3 bats. 8 July 2016 - Community work day. Joined by 20 students from Melbourne High School. Planted 106 kidney plant (Dichondra repens), 54 bidgee-widgee (Acaena nova-zelandiae), 54 ruby salt bush (Einadia nutans), 27 Forest germander (Teucrium corymbosum), and 27 clustered everlasting (Chrysocephalum semi-papposum) on both sides of path from the bridge to culvert. Spread 4 ute loads of mulch behind lomandras west of path bend past culvert. 25 volunteers - 87h work. 26 June 2016 - Community work day. Planted 54 Microlaena stipoides, 106 kidney plant (Dichondra repens), 54 purple-sheathed tussock-grass (Poa ensiformis), 22 mallee wattle (Acacia montana)(a rare plant in Melbourne) and 27 hop goodenia (Goodenia ovata), 22 prickly moses (Acacia verticillata) and 27 Spiny-head Mat-rush (Lomandra longifolia) both sides of path below Chris Cross picnic area. 7 volunteers - 24h30m work. Eastern spine-bill, fairy wrens, mudlark, robin? 18 June 2016 - Bat check. 6 Gould's wattled bats. 10 June 2016 - Community work day. 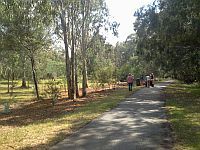 Planted 54 Microlaena stipoides, 54 tufted bluebells (Wahlenbergia communis), 54 pale Flax Lily (Dianella laevis), 17 rosemary grevillea (Grevillea rosmarinfolia(Plenty form)) and 37 rock correa (Correa glabra) south of path between Chris Cross track and culvert. Burned a small stack of debris from beside the path in the same area. 7 volunteers - 22h30m work. 4 June 2016 - Spread 1½ ute loads of mulch beside path in golf course triangle. 1½ hours work. 29 May 2016 - Community work day. Planted 54 Poa ensiformis, 108 kidney plant (Dichondra repens), 54 basalt daisy (Brachyscome multifida), 27 tufted bluebells (Wahlenbergia communis) north and south of path just west of the culvert, and 54 berry salt bush (Atriplex semibaccata)and 27 tufted bluebells (Wahlenbergia communis) on top bank near Chris Cross entrance. 12 volunteers - 36h work. 21 May 2016 - Mowed verges, south-west woodland, southern golf course triangle, picnic area and top level. 2.5 hour work. 13 May 2016 - Community work day. Planted 54 Poa ensiformis, 54 ruby salt bush (Enchylaena tomentosa), 54 kidney plant (Dichondra repens), 54 basalt daisy (Brachyscome multifida), south of path b/w track and culvert, and along path in golf course triangle and opposite golf course fence. Weeded some kapok vine and angled onion. 10 volunteers - 32h work. 12 May 2016, an arborist (Treetec Arboriculture & Ecology, www.treetec.net.au) cut chainsaw hollows into trees at the reserve to provide habitat for gliders and microbats, and to collect data on the usage of hollows as part of a Latobe University research project. Fourteen (14) glider hollows were cut, and about forty (40) bat cavities cut. Check the photos showing the making of a glider hollow. 7 May 2016 - Spread ½ ute load of mulch beside path in golf course triangle. Bat check 7 Gould's wattled bats in 4 tubes. 1½ hours work. Reserve visitor donated $50 to our work. 5 May 2016 - Mowed verges, area near pumping station, picnic area and top level. 1 hour work. 30 April 2016 - Spread 1½ ute loads of mulch beside path in golf course triangle. Slashed around shipping container and upper area. 2½ hours work. 24 April 2016 - Community work day. Planted 54 Poa ensiformis, 54 ruby salt bush (Einadia nutans), 54 kidney plant (Dichondra repens), 54 bluebells (Wahlenbergia communis), along path in golf course triangle and opposite golf course fence. Spread 2 ute loads of mulch on cardboard along path on golf couse triangle. 8 volunteers - 25h work. 20 April 2016 - Spread ½ ute load of mulch near southern noticeboard and along golf course fence. 1 hours work. 16 April 2016 - Spread 1½ ute loads of mulch near southern noticeboard and along golf course fence. 2.5 hours work. 13 April 2016 - Mowed mid section and eastern section of woodland. Spread 1 ute load of mulch near southern noticeboard. 2.5 hours work. 9 April 2016 - Bat check. 1 Gould's wattled bat. 8 April 2016 - Community work day. Planted 108 Poa ensiformis, 54 bidgee widgee (Acaena nova-zelandiae), 54 kidney plant (Dichondra repens), 25 hop goodenia (Goodenia ovata), 25 Forest germander (Teucrium corymbosum), 25 basalt daisy Brachyscome multifida, 25 ruby saltbush (Enchylaena tomentosa) and 1 wonga vine (Pandorea pandorana) along path in golf course triangle and opposite golf course fence. 8 volunteers - 29.5h. work. 2 April 2016 - Spotlight and thermal camera tour of reserve found 2 ringtail possums and 1 tawny frogmouth. 30 March 2016 - Spread mulch north of the track (B5) to cover laid out cardboard from Sunday. 2.5h. work. 27 March2016 - Community work day. Spread 1 ute loads of mulch (with cardboard) north of the track (B5) and 1 load in golf course triangle. 4 volunteers - 14.5h. work. 26 March 2016 - Mowed verges, picnic area, car park area and golf course triangle. Mower belt drive came off after running over a small branch. Took 2 hours to fix with Andy's assistance for the last 10 minutes - i.e. he fixed it!. 4h. work. 19 March 2016 - Bat check - 1 recaptured Gould's female and 8 new bats. 11 March 2016 - Community work day. Spread 5 ute loads and 1 truckload of mulch (with cardboard) along the track (E4 - G5). 9 volunteers - 31h. work. 2 March 2016 - With Bob's assistance, installed a solar powered vent in the shipping container. Watered 110 kangaroo grass (Themeda triandra) planted 24 Feb. 2h. work. 28 February 2016 - Community work day. Spread 3 ute loads of mulch (with cardboard) north of the track (B5). 8 volunteers - 26h. work. 27 February 2016 - Slashed blackberries on Chris Cross slope (G5/6). Mowed southern woodland and verges. Removed broken post near gate. 3h. work. 26 February 2016 - Watered 110 kangaroo grass (Themeda triandra) planted 24 Feb. 1h. work. 24 February 2016 - Planted 110 kangaroo grass (Themeda triandra) in D5 - D6. 3 volunteers - 8h. work. 12 February 2016 - Community work day. Spread 5 ute loads of mulch (with cardboard) west of the track in woodland area. 14 volunteers - 41.5h. work. 10 February 2016 - Mowed verges, picnic area and southern area of golf course triangle. 2 hrs. work. 31 January 2016 - Community work day. Spread 3.5 ute loads of mulch (with cardboard) east of the track in woodland area. 11 volunteers - 42h. work. 25 January 2016 - Grubbed thistles, desert ash, nightshade, ink weed and some other weeds north of the billabong. 1.5 hrs. work. 21 January 2016 - Grubbed desert ash, thistles, nightshade, ink weed and some other weeds north of the billabong. 1.5 hrs. work. 18 January 2016 - Thanks to Sam and Bob of Chris Cross Garden Centre, 2 front-end-loader buckets of soil were dropped into the ruts near MW pumping station. These ruts were probqably responsible for the damage to the ride-on mower on 28 September. Grubbed spear thistles, (hundreds of) desert ash seedlings, pittosporum seedlings, inkweed, nightshade and some other weeds in north-east area of billabong. 2.5 hrs. work. 15 January 2016 - Slashed thistles, nightshade and some other weeds in golf course triangle, and tidied up the shipping container. 3.5 hrs. work. 14 January 2016 - Assisted setting up trail cameras and bat detectors at 3 sites, in preparation for 'chain saw hollows' for microbats. 3 hrs. work. 6 January 2016 - Constructed an incinerator from a 200L drum and tidied up the shipping container. 3.5 hrs. work. 5 January 2016 - Spread 1.5 ute loads of mulch on cardboard east of the path in the woodland. 1.5 hrs. work.